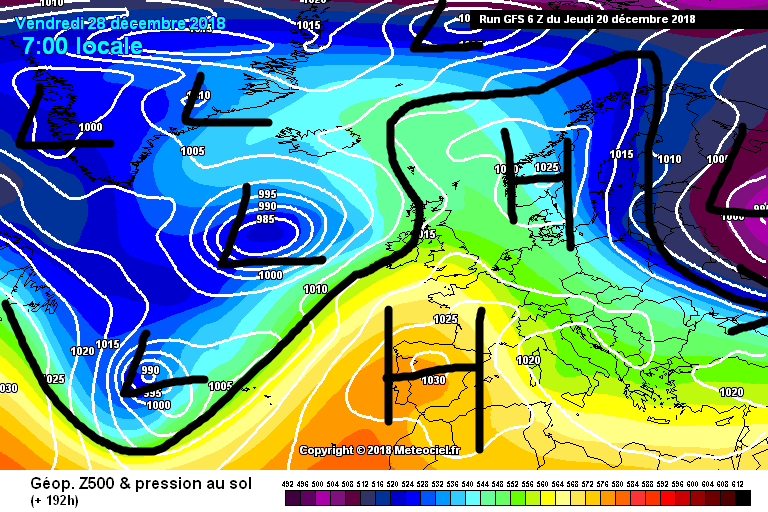 Not bad for a mean chart @ +180hrs when you consider a lot of the suite have those lows over us sliding more to our south, there's definitely a wintery outcome possible over the Christmas period- as ever, time will tell. These means may actually be useless if the op runs lead the way here. The models haven't got a grip on the situation yet and this will likely get worse as the strat warming comes into play. GFS out in FI showing Atlantic mixed with unsettled cold wintry outbreaks from the NW /N . The Jet, according to the GFS, looks to take a more Southerly route in general below Ireland letting colder air sink down over us. ECM out to +240 in general looks colder than this week with a milder interlude associated with fronts going through towards Fri 21st. 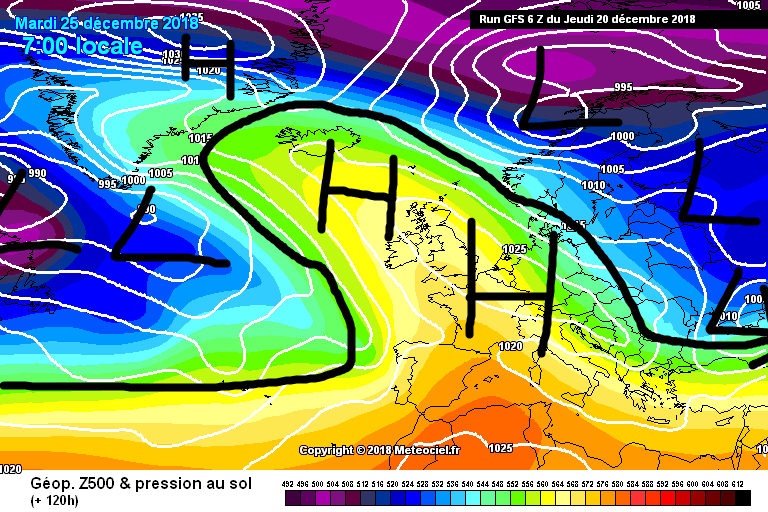 Well the cold might get there for the 25th going by the ECM and GFS. GEM different story. Last edited by Reversal; 18-12-2018 at 14:18. We saw from last February the kind of impacts a sudden stratospheric warming (SSW) event can deliver to the troposphere if it fully propagates and evolves in the way it did from a displacement to a full on split of the Polar Vortex. This December 2018 event is going to be a displacement but some outlooks show the possibility of this becoming a split in early January 2019 including the ECM and UKMO Glosea5 though the latter we do not have access to for stratosphere data and can only go off of snippets given on Twitter occasionally. We will have to see if it evolves into a split as we get closer to that timeframe. If I were to guesstimate, I'd say a split has a reasonable chance with record breaking heat flux being transported into the stratosphere. In case you do not know, heat flux is heat transported from the tropics to the poles by weather systems. This heat is propagated up to the stratosphere and results in "waves of warmth" which disrupt and or weaken the stratospheric Polar Vortex. Sometimes this warmth can propagate back to the troposphere and do the same to the tropospheric Polar Vortex. That's the basic definition of it, there's another level of complexity involved but I won't get into that! This heat flux should in theory intensify any stratospheric warming events in the New Year and result in a split of the Polar Vortex but as ever with weather, there is no guarantee. During the next two to three weeks starting next week, do not expect the model output to be the greatest with lots of flips and flops as a result of this warming in the stratosphere (though it hasn't really been great since the end of the May/June warm spell). We should know this well by now given what we had pre-the Beast from the East earlier this year. Remember that splits tend to have quicker tropospheric responses than displacements. 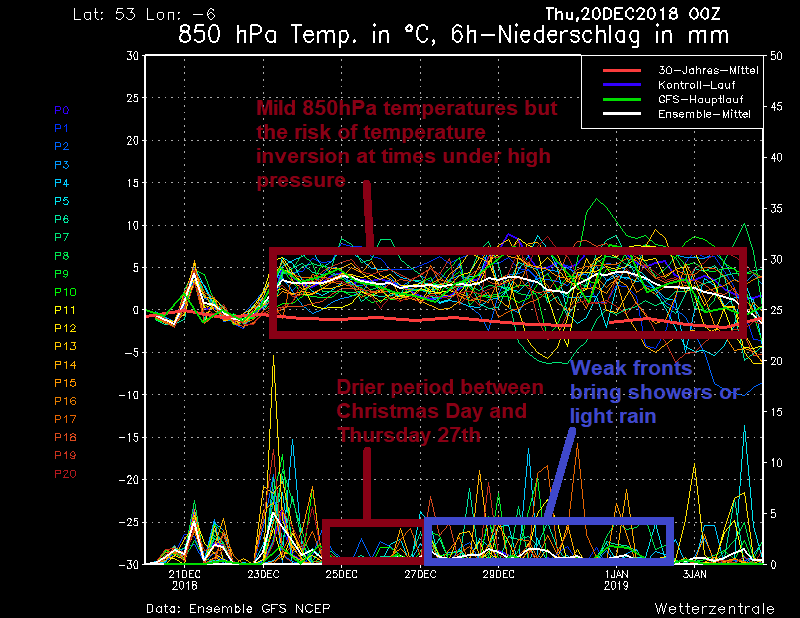 In terms of latest output, Christmas Day looks mild and settled with a lot of cloud around. On the GFS, the high is positioned more over top of the country attempting to retrogress to Greenland where there is a weak ridge but by the end of that week, the high gets pushed into the Mediterranean as low pressure systems gang up in the Atlantic. Initially, one would think this is a sign of an Atlantic onslaught. Whilst it does look like the signal is getting more unsettled as time goes on, the fronts look rather weak to me which would really only deliver a lot of cloud and patchy to light rain for the majority of places. If the high proves more stubborn than the model is showing right now, I think there'd be some instances of temperature inversions. 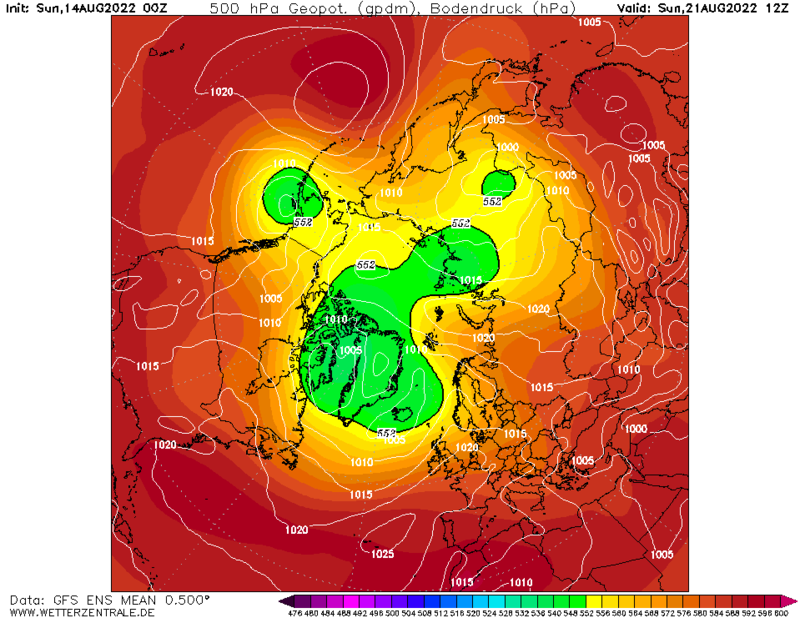 This means that upper air layers would look mild, for example 850hPa, on charts with their temperatures. However, the surface would be chilly under high pressure with mist and fog occurring at times. This is more likely in the UK due to more runs and charts showing the high pressure is going to be centred around the east of the UK or southeast following Christmas Day. The GEFS for Dublin look mild in terms of 850hPa temperatures with a dry Christmas Day and St. Stephen's Day but becoming more unsettled from December 28th onwards albeit quite weak rainfall signals with not a lot expected. Remember that if high pressure lies around longer than the operational run is suggesting, we could have some temperature inversions with the surface more chilly than what the 850hPa temperatures would suggest. When I say chilly, I mean temperatures in the mid single figures (slightly below average) so nothing overly cold. The ECM shows the high pressure centred further to the southeast of the UK on Christmas Day than the GFS which leaves Ireland in a mild southerly flow on the western flank of the high. This would bring drizzle to localised parts of the country and temperatures in the double figures under a lot of cloud. My Winter forecast released on November 27th suggested a mild and wet December which has verified very well. It also showed a chilly and blocked January with a lot of dry weather. There was the small risk of quite a wintry January although my analogues highlighted a severe January to come (which I did not rate highly at all). 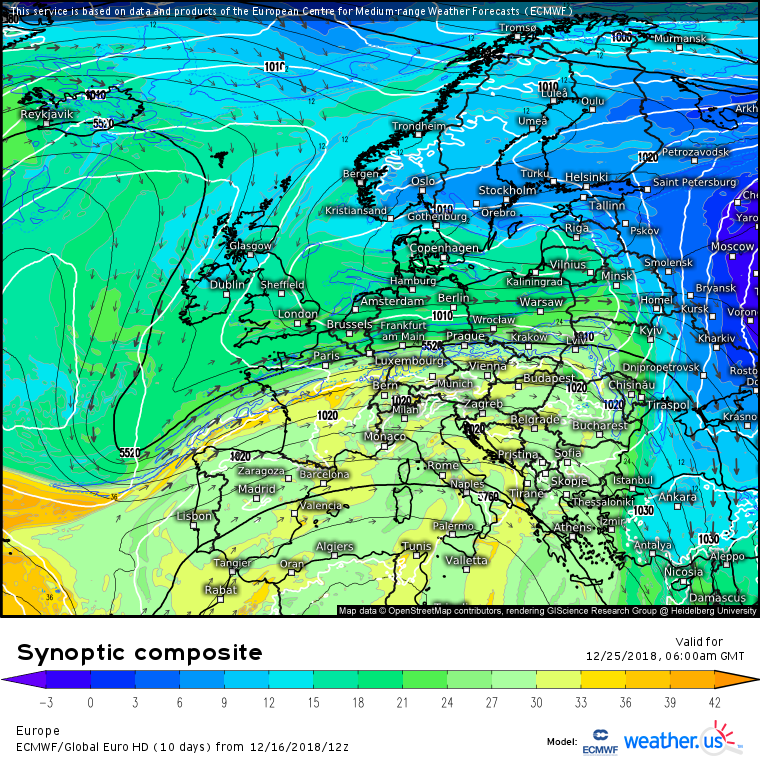 Going by the UKMO and the EPS, my forecast is not looking too far fetched for January (so far). Overall, quite a benign outlook for the end of 2018 with some dry weather expected around Christmas Day as high pressure ridges in. Different positioning of the high pressure on models will determine how mild it gets. Some more unsettled weather possible during late December but far from a washout. If the Polar Vortex does end up splitting in early January, I'd expect some tropospheric responses start to showing on models around the second week of the month minimum with blocking over Greenland/Scandinavia. However, that's highly speculative. Focus on the here and now. Model output is going to be useless generally for the next two to three weeks. Sryan, thanks for detailed update! No idea how old MT is, but his ready made replacement is already waiting to step up!! To expand on what Sryan was saying about random model solutions, the GFS 12z shows a cold easterly with snow showers for the east coast and -11c uppers getting into the southeast for the first few days of January. Not gonna happen but it shows the randomness of the output... from very mild to very cold. How does between Christmas and New year look? Thanks in advance if anyone answers.